Cadenza's two affordable plans both offer modern website designs packed with powerful, but easy to integrate features. Explore each feature to choose the plan that's right for you. Cadenza is designed especially for bands, choirs and orchestras and other organized performing groups. Jump-start your new website with predesigned themes, pages for adding ensembles, directories for teachers, and enter your rehearsal and performance calendar. 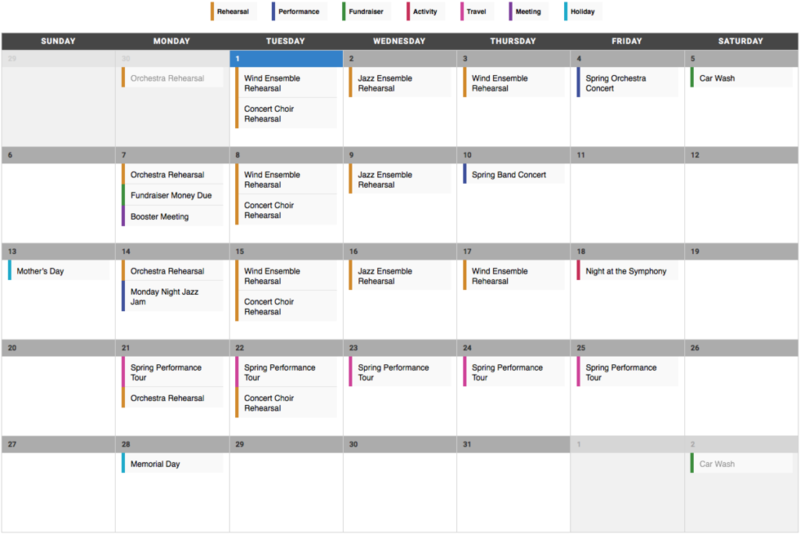 The Events Calendar is one of the most important tools you'll use for adding rehearsals, performances and other activities, and let visitors filter the view just for the things they need to attend. Events are can be detailed to provide full event information like venues, maps, organizer contact info, documents, and any general information. Getting information to your members and supporters is vital to your success and effective communication can be a challenge. Use Cadenza as the hub of information for all of your groups, under a single interface to publish news, build forms to collect data, and make special announcements or alerts. Click a feature for more information. 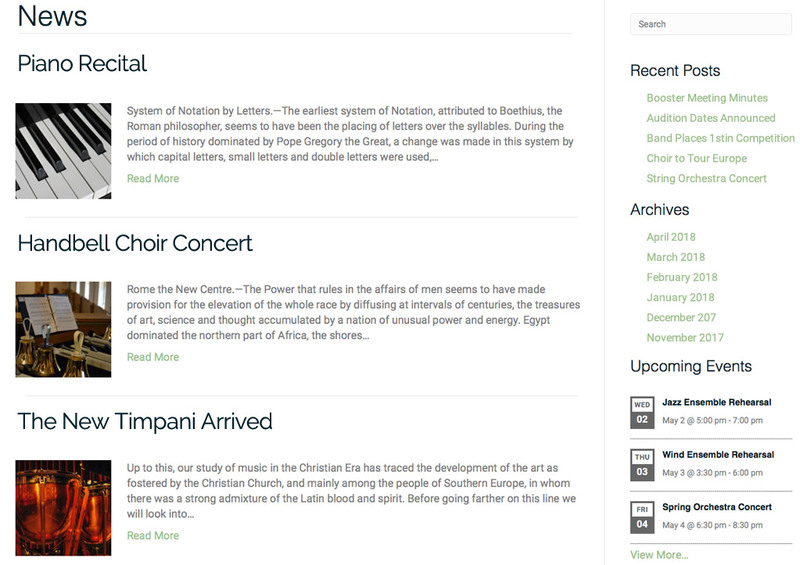 Cadenza is designed for bands, choirs and orchestras for promotion and program communication. Introduce your talented and qualified staff, music directors and instructors and showcase each of your performing groups. Write News articles of interest or importance, create new post categories or start a blog. Share posts publicly or privately. Easy scheduling for recurring rehearsals, concerts, activities and more, plus exporting and sharing with other calendars. Multiple ways to create engaging photo galleries and slideshows, or embed video and play MP3 audio clips on any page. Drag & drop rows and columns to build the perfect page just the way you want it. Incredibly flexible, but easy to use. Dozens of exciting ways to display your content with an easy drag & drop interface. Build a pro site without adding a line of code. Pre-made page templates, ready for easy editing. Swap out text and images, or tweak the layout as much as you want. Use Cadenza's starter forms or build custom forms for information, sign-ups, registrations and more, with an easy drag & drop interface. Add special alerts and notifications to your site or specific pages make visitors aware of important information or required actions. Sell banner ads to display on your website and help fund your program. Your pricing, your profit, with easy management and reporting. Create events and ask for help. Volunteers sign up for specific tasks and you keep track of who's showing up, when and where. Attendees can RSVP to your performances, meetings, celebrations or activities directly from your events calendar. Connect your favorite payment gateway and sell tickets to your performances or events. Digital tickets, check-in app and seating charts. Create online surveys or polls to add interest to your site. Build them for fun, or to gather important information. Create quiz questions and answer choices as radio buttons, drop downs or checkboxes, graded either on a pass/fail scale or a letter grade system. Form users can upload files directly to your DropBox, without you having to download them to your computer first. Don't miss important information! Get notification through Slack when someone submits one of your online forms. Collect payments of any kind through your site with your favorite payment gateway like PayPal, Stripe or Authorize.net. Drag & drop rows of content sections to build pages ever faster. Mix and match exactly what you need to get your message across. Get started building your custom Cadenza website today!